Marie's Nutcracker Sweet, Inc. is a family owned and operated specialty bakery located in the East Hills area of Historic Johnstown Pensylvania, home ot the famous Johnstown Floods. The bakery was named for the famous signature product -- Nut Roll -- by founder and chief baker Marie Duffy . Based on the traditional Eastern European treat known as kolache, it was Marie's nut roll that led to the opening of the specialty bakery. While nut roll traditions vary from one area to another, one tradition that is almost universal is nut roll for the holidays and special occasions. 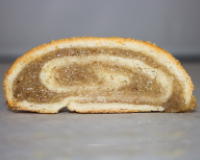 Known as potica in Slovenian (or povitica, depending on the region) or Orechovnik in Slovak. Whatever its name, nut roll is one Christmas pastry that is always a beloved treat, re-kindling cherished memories. Please enjoy your visit to our site and feel free to contact us with any questions or suggestions.